Certified to BS 8484:2018 (App side) the webeyeSOS app transforms a smart phone or PDA to a professional quality personal safety device with unique critical safety features. The pay as you go service avoids the expense of a dedicated personal safety alarm and gives an extra layer of security to your staff. Our automated system makes sure notifications get through to the right people and we alert you if there is a potential problem with your signal. If you feel threatened an alarm can be triggered by shaking the device or pressing power button or on-screen button, the app immediately sends your GPS location and identity to your chosen recipients. All the safety features in the world are useless unless you are confident that you are connected. Never be left guessing the whereabouts of staff. An addition to the webeyeSOS app, and an ideal compliment, is the webeyeSOS track me management function which allows you to monitor and track the movements of your staff. 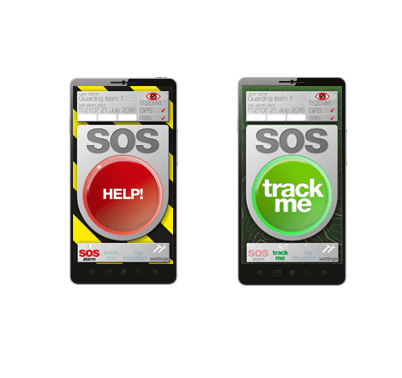 Once they reach a site they press the track me button enabling you to follow their route in real time and verify their actions.